"The stars at night are big and bright- deep in the heart of Texas." and so the song goes. But did you know that August is one of the best times to sit out under the big Texas sky with your family and watch for shooting stars? Each year between July and August the Perseids meteor shower passes over North America and lights up the sky. Do you remember the first time you wished upon a shooting star? Put nature on your calendar this month, only it might be a little later than most of your other outdoor adventures. Each month TCiN tries to highlight an Outdoor Activity of the Month. 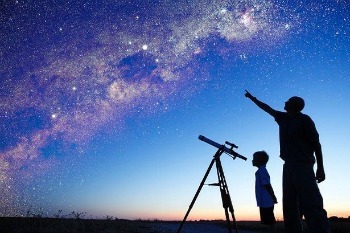 Here are a few suggestions on where to enjoy the night skies. Colorado Bend State Park- Colorado Bend State Park is a popular star-gazing destination since it’s an hour and a half from the nearest sources of light pollution. Inks Lake State Park– Inks Lake State Park is far enough from an urban setting to enjoy the stars. The lake is also a place to cool off during the heat of the day. Garner State Park– Garner State Park is fun both during the day and at night. Cool off in the Frio River during the day under the sun, and enjoy dancing under the stars at their weekend dances. Enchanted Rock State Natural Area- is one of very few parks given the title "International Dark Sky Park," meaning it is a noted place to star gaze. Hill Country State Natural Area– Enjoy the distance from any major source of light pollution by falling asleep staring at the stars in the sky. Lost Maples State Natural Area- The park offers visitors spectacular evening views of star clusters in a sky void of city lights. Caprock Canyon State Park- Caprock Canyons State Park is located in Quitaque, Texas. This 15,000 acre area of land is home to the only wild bison in Texas. Because of the canyon hills blocking out lights from nearby cities, it's the perfect, isolated area to appreciate the sights of the sky. The Milky Way is commonly scene at the park on nights with clear skies. Padre Island National Seashore– is situated along the coast of Texas. Its remoteness from the mainland offers the paradise-like feel you’re looking for in a summer getaway. The summer sunshine highlights the shore’s beauty during the day while millions of stars illuminate the peaceful night sky. Brazos Bend State Park-encompasses nearly 5,000 acres of diverse ecosystems. After a day of play and adventure, sit among the wildlife and enjoy the million points of light shining down in this beautiful and peaceful park. Copper Breaks State Park- is an "International Dark Sky Park," with the exception of receiving the "gold tier" viewing status. It's clear landscape and lack of pollution contribute to the favored spot of astronomers and star gazers alike from around the world. Stephen F. Austin Observatory- is the second largest observatory in Texas. It is used by the Austin State University as a teaching resource and a research facility. The observatory is frequently (but not always) open to the public and houses a variety of powerful computer-controlled telescopes within the observatory along with free-standing telescopes on the grounds. Its location is far from city lights making the velvet black night sky a feast of celestial lights and colors.